Distinctive features: Tree; Tall narrow pillar-like shape. 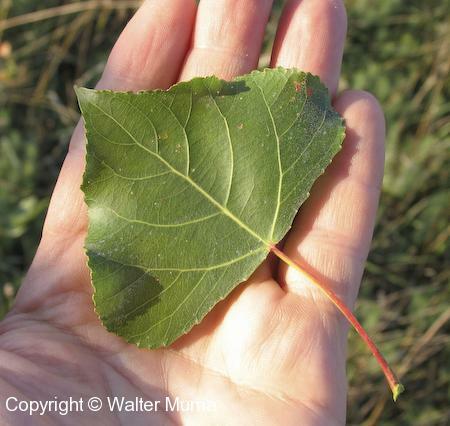  Eastern Cottonwood (Populus deltoides) - Leaves are bigger; tree lacks the pillar shape of Lombardy Poplar. Photographs: 20 photographs available, of which 5 are featured on this page. SCROLL DOWN FOR PHOTOGRAPHS. Lombardy Poplars have a distinctive shape. A line of Lombardy Poplars along a country road. A Lombardy Poplar leaf, upper surface.